Since I'm almost certainly the only blogger left in the world who hasn't spoken regarding conference realignment, I've decided to continue in that vein by publishing someone else's thoughts on the subject. These come from my friends Peter and Amanda, who sent these to me via email back during Penn State weekend (for some reason, I haven't posted them until now). Keep in mind, these belong to a minister raised by Georgia Tech fans, his wife (possibly a closeted genius) and (most likely) their 2-year-old daughter (absolutely a genius). 6. A&M & Baylor for West, GT and a non-Miami FL team for East. 7. Take A&M, Baylor, OK, & OK State. Move UA & AU to East. 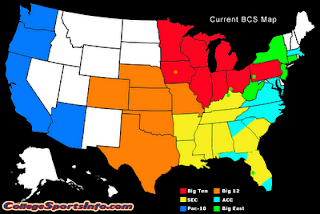 Convince BCS the SEC gets 2 automatic bids. 8. Take 6 teams from the big 12 and 6 teams from the ACC: A&M, Texas, Baylor, TX Tech, OK, OK State. FSU, GA Tech, Clemson, Duke, UNC, NC State. 2 SEC semifinal games - west vs. Far west, east vs. Far east. Winners play in Sugar Bowl. We could call it, perhaps, the Southeastern Conference of Football Universities, or abbreviated, SEC FU?